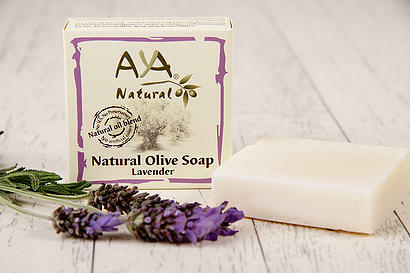 Cleanse & calm lavender soap is based on cold processed premium virgin olive oil. Its essential fatty acids and high vitamin E, A and antioxidants content make it an excellent emollient, nutrient, conditioner for all skin types and hair, and a perfect facial cleaner. The products are made by a unique natural method free of artificial fragrances, colors, preservatives. Adding pure essential oils is to give the products additional natural properties and fragrance. The ingredients of the soaps are mixed, poured into small molds, hand cut and cured for 8 weeks. All the soaps are handmade, soap by soap, as a combination of saponified vegetable oils that give your skin good synergistic effects. Because they are handmade, they are not always the same size or exact weight, no batch same as the other batch. All soaps are about 100 g.
Lavender cleansing soap soothes and calms the skin. 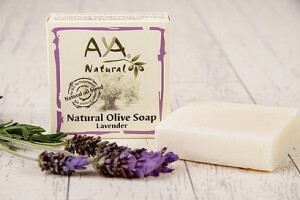 This Natural Soap using cold pressed vegetable oils based on virgin olive oil scented with lavender essential oil. The combination is rich in vitamin E and antioxidants, essential fatty acids, antioxidants and minerals. Cleansing and smoothing your skin for fresh, radiant, pure sensation. Lavender is known to have antibacterial and antifungal properties, calms the skin and reduces redness and irritation. Especially recommend for sensitive and itchy skin. - Natural Handmade Soap made in batches. -Alcohol free, SLS free. Petroleum derivatives ingredients free. Artificial additives Free. Soap bars 95 - 105 g, about 3.5 oz. (Handmade cut). Sodium Olivate (Olive Oil), Purified Aqua (Water), Sodium Cocoate (Coconut Oil), Sodium Palmitate (Palm Oil), Persea Gratissima (Avocado) Oil, Shea Butter (Butyrospermum Parkii), Castor (Ricinus Communis) Oil, Buxus Chinesis (Jojoba) Oil, Lavender (Lavandula Angustifolia) Oil, Rosmarinus Officinalis (Rosemary) Leaf Oil. - Use on wet skin, lather and rinse off with water. Avoid contact with eyes. If contact and irritation occur, gently flush with water. Never leave the soap on the side of the bath or in puddle of water. It will simply become mushy and unusable. Always store the soap in cool dry place where air can circulate, this keeps the soap hard. According to our knowledge, this soap is non – allergy soap, but we recommend doing sensitive skin allergy before using this soap. People with skin allergies should test the soap on a small spot of skin first and stop using if irritation occurs.